Royal Palace of Aranjuez is an impressive palace complex in Spain. Locally known as the Palacio Real in Aranjuez. This is the official residence of the Spanish king, which is located in the town of Aranjuez, which in turn is part of the province of Madrid. As part of the royal palace estate in Aranjuez the Royal Palace is open for public visits. Royal Palace of Aranjuez was built in 1561 by King Philip II. It was primarily built to serve him as a royal summer residence and in the 18th century the beautiful palace was restored after which it was destroyed in the conflagration. The castle is situated near the banks of the Tajo River. Royal Palace of Aranjuez is also included in the list of world heritage by UNESCO. The east side of the palace is complemented by a beautiful garden known as, Parterre Garden, and the north side has a small island which was built and called, Garden Island. The beautiful addition to the east was built in 18th century and was known as, Garden of the Prince. There is also a smaller but equally remarkable building called Casa del Labrador. When King Philip II ordered the construction of the Royal Palace of Aranjuez, he assigned the project to architects, Juan Bautista de Toledo and Juan de Herrera, who also designed the remarkable El Escorial. 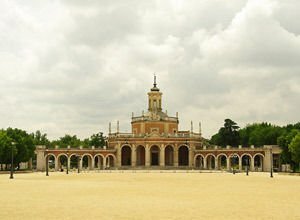 The castle was completed during the reign of Ferdinand VI and a little later Charles III added two wings to the magnificent edifice of the Imperial Palace of Aranjuez. The most important historical and art collection, which today can be seen beyond the walls of the royal castle is the Museum - Museo de la Vida en Palacio. From there you can learn details of the life of the Spanish monarchs. An interesting fact is that the popular artwork in Concierto de Aranjuez, written by Spanish composer Joaquín Rodrigo in pursuance of the guitar and orchestra, was inspired by the beautiful gardens of the Royal Palace of Aranjuez. The musical work attempts by musical sounds to transform nature and the beautiful gardens around the castle.